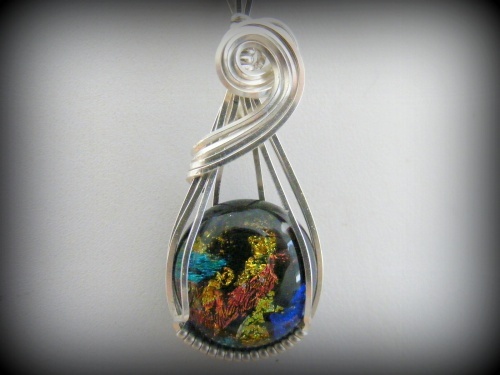 Sweet multi colored dichroic pendant with minimalist design. Perfect for those who don't like big pieces. Has all the explosive flicker of the dichroic and yet sweetly muted by the design. Sterling silver cradles this piece and makes it one of a kind. Measures a little over 1 1/2" long from top of bail to bottom of piece and 1/2" wide. Comes with a sterling silver snake chain.